Home > Travel > Ride-sharing > Uber Driver-Partner Requirements: Is It Uber Cool To Drive With Uber? Uber is taking the world by storm. Instead of hailing a taxi in the pouring rain, you’re able to sit inside and request a ride using an app on your smartphone. Consumers love this and drivers make earnings off of it. With more people using Uber, there is an increase in the demand for Uber driver-partners. Maybe you could make a few bucks with Uber? Learn more about Uber driver-partner requirements below. Uber is the app used for drivers and riders to connect. Therefore, to drive with Uber you must have a smartphone. UberX is the standard vehicle class. UberX drivers use their own 4-door vehicles to pick up riders. There are other vehicle classes available as well, but this varies by city. These classes may include UberX, UberXL, UberSelect, UberBlack or others. Below are the driver partner requirements. Other requirements exist. 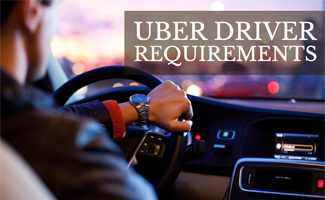 UberX car requirements include an eligible vehicle. Model/Year requirements vary by city. UberXL must seat 6 passengers or more. UberXL vehicles include SUVs or minivans. Rides are typically more expensive than UberX. UberSelect seats up to 4 riders. These vehicles are luxury vehicles. UberBlack is the premium luxury service. These are commercially registered and insured – think Limo-type services. Vehicles are typically black SUVs or luxury sedans. These rides have the highest fare. The first step to getting started as an Uber driver-partner is easy. All you have to do is sign up online. More steps come after that. But before you sign up, you may want to know how much drivers make in your city, as the earnings vary by location. How Much Can I Earn as an Uber Driver-Partner? Earnings are based on time and distance of the trip, as well as vehicle class (UberX, UberXL, UberSELECT, UberBLACK, UberSUV and UberLUX), location and other factors. Uber does not allow us to list any rates in this article. For more details on earnings and to see how Uber compares to Lyft, check out our article Driving with Lyft vs Uber. Are you an Uber driver-partner? What has your experience been? My mom has been thinking of starting to drive for Uber. She is semi-retired and looking for some extra income with a flexible schedule, plus she loves to drive. She asked me what I thought about her driving Uber and whether I think it is safe for her to do. Does anyone have any thoughts on this that I could share? Would you let your mom drive an Uber? Any tips on best time of day, locations to avoid, etc. I recently applied to be an Uber driver and it was a breeze – used my iPhone to upload the required documents and after a week or so it was all approved….easiest job interview ever! Now whenever I can’t sleep I find myself turning on the app and surprisingly people need rides at all hours of the night. I am in Austin driving during SXSW and heard they invited Uber drivers from San Antonio and surrounding areas to come down since it’s such a busy time of year and they can use all the extra help they can get. With surge pricing it has been great extra money too!